Late in the afternoon of Tuesday 15th July 2003, workmen moving a large pile of topsoil on the Soar Valley Developments building site between East Road and Brook Street at the eastern end of Wymeswold were surprised when a human skull rolled out of the earth in front of them. The police were called and a search for other human bones was made. The skull was taken to Quorn Police Station for safekeeping overnight. The following lunch time there was a meeting between representatives of the police, Leicestershire County Council Heritage Services (previously known as Leicestershire Museums), the developer's site manager plus myself, attending in my capacity as Archaeological Warden for Wymeswold. The constabulary's scene of crime officer was a professionally-trained archaeologist who specialised in human bone analysis – certainly the right man for the job! He examined the skull, which was generally in a good state of preservation, and identified it as that of a male aged over forty at death. The man had lost all his back teeth (molars) during his life, one to a major abscess, and the bone had healed over. The four remaining front teeth were quite heavily worn down, strongly suggesting that he had regularly eaten food which contained grit; this is quite typical of flour prepared by traditional milling techniques in use before about AD 1300. So the scene of crime specialist was quite confident that the man had died more than a hundred years ago which means that the police do not have to take any further interest. The skull the day after its discovery, with the spoil heap where it had lain. Without expensive radiocarbon dating there is no way to know how long ago the man lived. Initial thoughts were that this might be a Roman burial (perhaps of someone who lived where late Iron Age and early Roman pottery was found nearby during the construction of Orchard Way in June 1990) but, despite considerable effort by the Heritage Services archaeologist and a subsequent follow up visit by myself, no other fragments of bone were found and the site as a whole has a surprising absence of any archaeological artefacts. 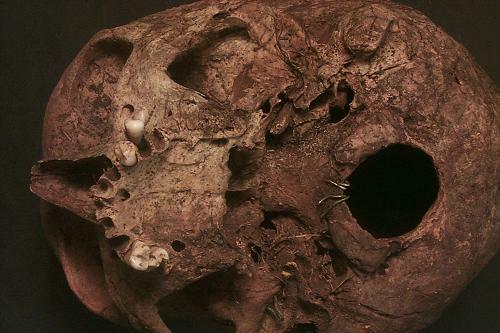 The topsoil heap contained earth from a large part of the site but the part of the heap where the skull appeared comprised of soil scraped from the surface, as it contained lots of turf and other roots. So the skull could not have been more than a foot below the surface before the topsoil was disturbed. So this unexpected find presented something of an enigma. The best guess was that this skull had been deposited on its own without the rest of the bones. This could have happened at any time, perhaps quite recently. The man could have died at any time before about AD 1300 and may not even have lived in this area. The skull was in a remarkably good state of preservation – indeed the top almost looked polished – which made the absence of any other human bone even more odd. Such good preservation was also odd, considering that the tooth wear indicated that the man had lived on a diet where flour was milled in a traditional manner, although such milling techniques died out in Europe in the thirteenth century! 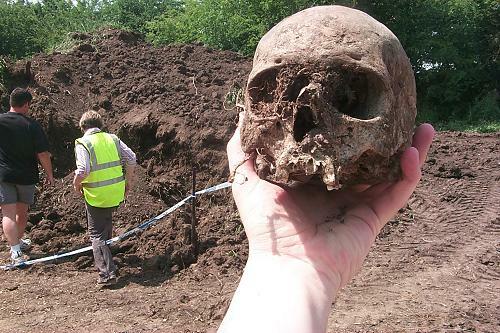 As is normal for archaeological finds in Leicestershire, the skull was taken to Leicestershire County Council Heritage Services' store at Barrow on Soar. Then one day in November 2003 I received a phone call from Dr Richard Pollard of Heritage Services. He had decided to clean off the small amount of mud clinging to parts of the skull, whereupon he discovered that the base of the skull – near to where it meets the spine – had been damaged. And the damage had been carefully repaired with several metal staples! The careful repair with metal staples. The excellent preservation and metal staples indicated that the skull was fairly recent. Yet, if the man had lived in Leicestershire, the tooth wear indicated that he must have died at least 700 years ago. Far more likely he had died within the last 200 years but had not lived in Leicestershire, or indeed Europe. Clearly this was no 'ordinary' skull. Noting the polished appearance of the top, Doc Pollard's best guess was that this had been a medical specimen. The skull had become detached from the rest of the man's bones and, for whatever reasons, been placed in a shallow pit on the edge of Wymeswold comparatively recently. Most of us will be aware of early nineteenth century 'bodysnatchers' such as Messrs Burke and Hare. Their nefarious activities led the passing of the Anatomy Act in 1832. This made human skeletons much more difficult to obtain in Britain. As a result there was – and, I understand, still is – a steady trade in human skeletons from such places as India, especially the banks of the Ganges. The tooth wear on the skull which reappeared in July 2003 is consistent with the person living somewhere such as India in recent times. Whatever the exact origin of this skull. he clearly was not 'local'. Therefore his skull was of little or no interest to archaeologists. In recent years archaeologists and curators have increasingly recognised that human remains should only be kept in museums if they can potentially tell us more about the past. Otherwise human remains should be reburied in an appropriate manner. 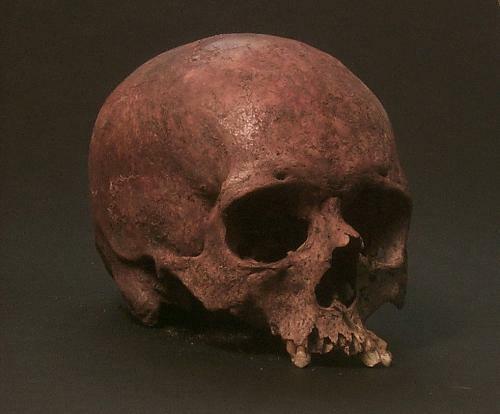 Interestingly, although Leicester City Museums had reburied the remains of several Anglo-Saxon people, Leicestershire's Heritage Services had not had cause to rebury any human remains. So the Wymeswold skull was the first occasion for reburial in the county. Leicestershire County Council provides funds to cover the costs and instructed Linda Willetts, then the Parish Clerk for Wymeswold Parish Council, to make the necessary arrangements. Linda in turn liaised with Ginny Westcott, Parish Councillor. The outcome of these arrangements was a reburial ceremony in Wymeswold cemetery on 10th February 2004. A small wooden casket was constructed by the funeral directors G.A. Gamble of Quorn and a suitable shallow grave dug by Tony Buckingham, who maintains the cemetery and has been the gravedigger for many years. I acted as casket-bearer and a prayer was read by Ginny. The ceremony was also attended by Linda, Graham Flowers (owner of Soar Valley Homes) and Viv Marshall (of the Wolds Historical Organisation), together with a photographer from the Leicester Mercury and a friend of mine, Anthony Weir, who also took photographs. Most of us then came back to my house for refreshments and to reflect on the rather unusual sequence of circumstances that had led to a man from, perhaps, India having his head buried, then reburied, in rural Leicestershire. Along the way he had posthumously become a well-polished and carefully restored medical specimen, then – over two hot days in July 2002 – evidence for a possible murder investigation, before becoming the first person's remains to be reburied by Leicestershire archaeologists. Thankfully most of us will not be subjected to such an exciting 'after-life'! 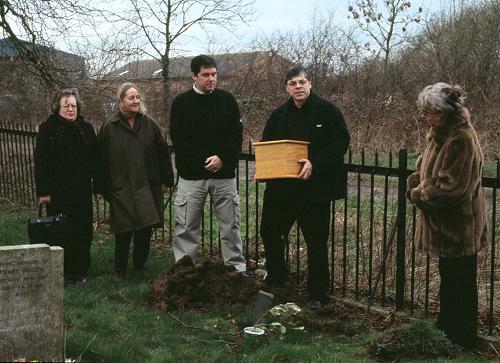 The reburial ceremony 10th February 2004. Left to right: Viv Marshall, Linda Willetts, Graham Flowers, Bob Trubshaw and Ginny Westcott. Photograph by Anthony Weir. Thanks to Ginny's involvement, the ceremony was featured in the Mercury on the day before and the day after the ceremony. Grateful thanks to Linda Willetts and Ginny Westcott for making the arrangements for this reburial. At the time of the reburial of skull there was no guidance about the most appropriate ceremony for non-Christian human remains. But a year or so later a group of people came together to form an organisation called 'Honouring the Ancient Dead' or HAD. More details about HAD here. In 2017, at the request of the HAD committee, the Chair of the WHO, Bob Trubshaw, was videoed recalling the events. This video is now online. Thanks to Jonathan Allen for shooting and editing the video and Sarah Levitt for making it all happen.